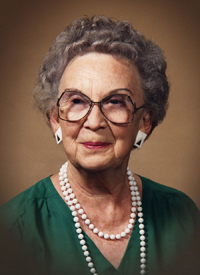 MayBelle Regina Gilbert, 99, of Hailey, passed away at Blaine Manor on Friday, May 16, 2008. The third eldest of seven children born to Thomas Edward Foley and Regina Theresa Marquette, MayBelle was born Dec. 29, 1908, in Mission, B.C., Canada, during a terrible winter storm; the doctor had to stay three days, sleeping on the couch, before he was able to get home. It was a story MayBelle loved to tell. On May 30,1937, MayBelle married Donald John Brunson, the love of her life, at Everett, Wash. They had two children, Judy Demetre and Donald John Brunson Jr. Tragically, her husband died of heart problems in 1948 and MayBelle went to work in the credit department at Frederick & Nelson Department Store in Seattle until 1971, when she retired to look after her second husband, George Gilbert, whom she had married in 1963. In 1996, MayBelle moved to Ketchum to live with her daughter, Judy. After she fell and broke her hip, she moved to Blaine Manor. Her family would like to take this opportunity to sincerely thank everyone at Blaine Manor for their generous, loving care of our Mom. MayBelle loved flowers and working in the garden, and had a very green thumb. Reading was another constant joy and pleasure and she enjoyed a wee drop at the end of the day—sherry, Bailey's Irish Cream or Champagne for special occasions. She was a very sweet, loving mother and grandmother and will be missed terribly. She is survived by her son, Don (Jeannie) of Mukilteo, Wash.; daughter, Judy Demetre of Ketchum; grandchildren Amy (Chris) Carrasco of Seattle, Wash., John-Michael Demetre of Tukwila, Wash., Matt (Leslie) Brunson of Marysville, Wash., Lisa Brunson of Shoreline, Wash.; and two great-grandauahters, Kianna Brunson and Mia Carrasco. A funeral Mass will be said for MayBelle at 11 a.m., Friday, May 23, at Our Lady of the Snows Catholic Church in Ketchum, with lunch to follow. In lieu of flowers, the family suggests donations to Blaine Manor/Croy Canyon Building Fund, Box 927, Hailey, ID 83333 or Hospice of the Wood River Valley, Box 4320, Ketchum, ID 83340.